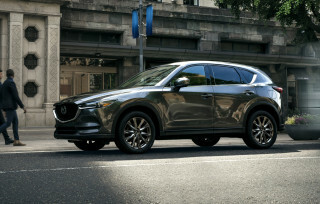 If you want one of the highest-mileage non-plug-in vehicles on the market—like the Toyota Prius, Hyundai Ioniq, Kia Niro, or Honda Insight, there’s been one quite significant deal-breaker for many Snow Belt families: All-wheel drive simply isn’t a possibility. That’s due to change very soon with the 2019 Toyota Prius AWD-e, introduced on the eve of the LA Auto Show and on its way to dealerships early next year. Simply put, the Prius AWD-e doesn't meddle with the Prius’ established hardware under the hood, including its dual-motor hybrid system and planetary-gear hybrid wizardry, but it adds a small electric motor at the rear wheels. Without any added complications like a center differential, the third motor can power the rear wheels at launch, up to 6 mph, and then whenever needed by traction, up to 43 mph. 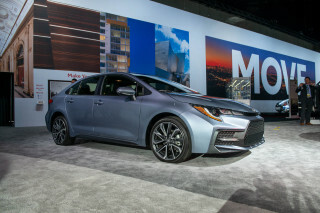 The motor in back is magnet-less, Toyota says, so it likely wouldn’t depend on any more of the sociopolitically worrisome rare-earth materials than the existing Prius models. AWD-e versions of the Prius have a special compact version of the nickel-metal hydride battery pack, while front-wheel-drive versions of the Prius all now have a lithium-ion pack. Cargo and rear seat-folding capability is the same in both versions, with 65.6 cubic feet once the rear seatbacks are folded forward. All Prius models for 2019 get slightly refreshed exterior styling—which essentially amounts to front and rear details. 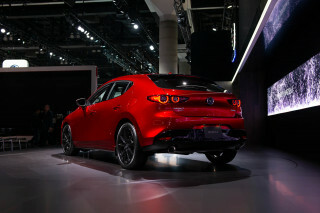 For 2019, two new colors are offered—Supersonic Red and Electric Storm Blue. There’s also a new two-tone 15-inch alloy wheel design on the AWD-e model. 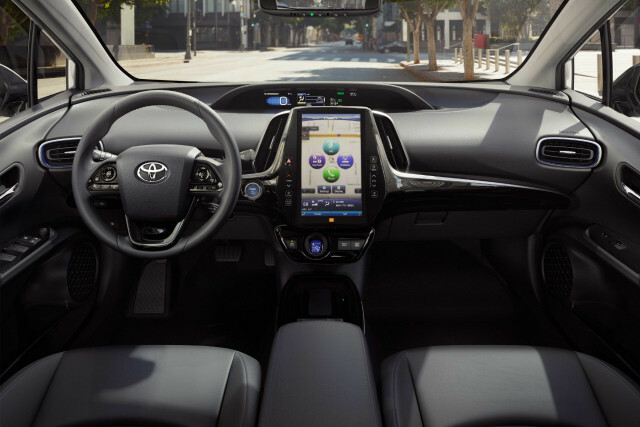 Toyota projects EPA ratings of 52 mpg city, 48 highway, and 50 mpg combined for the Prius AWD-e. The L Eco version of the Prius achieves up to 58 mpg city, 53 highway, and 56 combined, while other front-wheel-drive versions get 54 mpg city, 50 highway, and 52 combined. Prius comes in L Eco, LE, XLE, and Limited while the AWD-e model is only offered in LE and XLE grades. 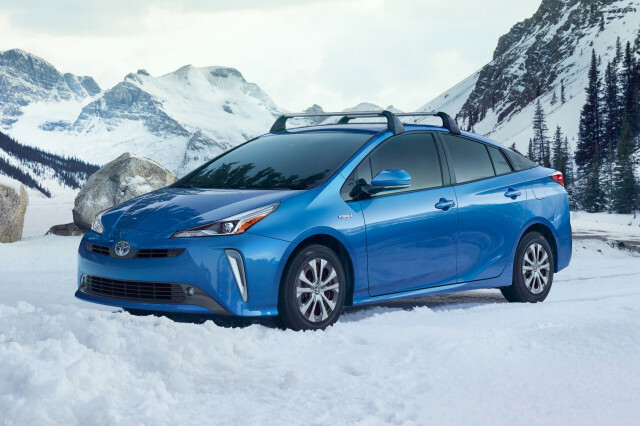 The top AWD-e XLE gets a few more things that other Prius models don’t, including upgraded SofTex heated seats and an 8-way power driver’s seat. Top Limited models come with the large 11.6-inch vertically oriented HD multimedia screen, plus navigation, an apps ecosystem, and JBL premium audio. Toyota anticipates that the all-wheel-drive Prius could account for as much as a quarter of U.S. Prius sales. 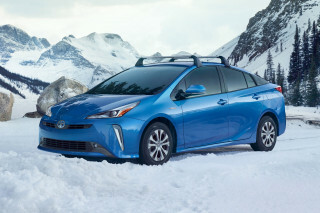 We’ll soon see if it helps add as much vigor back to Prius sales as to those it helps out to the ski slopes.